Zuma Beach in Malibu, California. 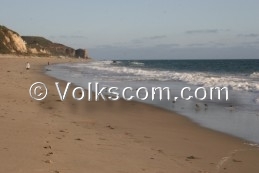 Zuma Beach in Malibu is very popular among beach goers. This beach is also famous as filming location. The sandy beach at Zuma Beach is pretty wide. The waves are rather small at this beach. This popular Californian beach was used as a movie location for various productions. In 2008, the TV serial “Eleventh Hour” (Episode: Frozen) played at the Zuma Beach. From Pacific Coast Highway, also known as California State Route 1, turn on Zuma Access Road towards the parking lot of the Zuma Beach (parking fee) or turn on Westward Beach Road with free parking space along the roadside.